They're brown, they're crunchy and they usually come encased in a hard shell that resembles the human brain. Toss them around in salads or use them in sinful desserts, they taste absolutely delicious every time. Walnuts are perhaps one of the most effective superfoods and can play a remarkable role in improving an individual's health. Walnuts are rich in omega 3 fatty acid or polyunsaturated fatty acid. Omega 3 fatty acids are considered absolutely essential, and can only be obtained only by consumption of certain kinds of food. 1. 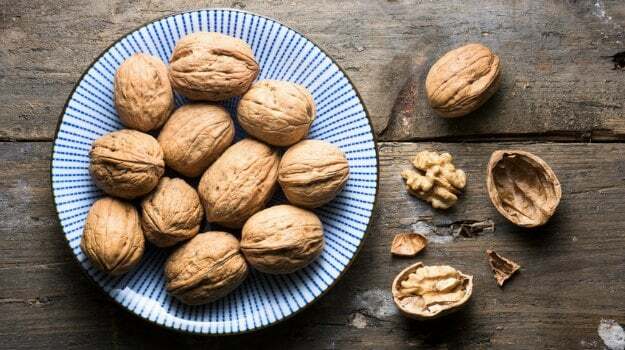 Help prevent cancer: Studies have shown that walnuts contain many nutrients like omega 3 fatty acid, phytosterol and antioxidants which not only prevent growth of tumors but also reduce the risk of developing breast and prostate cancer. 3. Help with weight-loss: Eating walnuts makes you feel full, which reduces appetite and helps with weight management. 4. Walnuts help in building resistance for insulin, control blood glucose levels and lower the risk of developing type 2 diabetes. 5. Eating walnuts during pregnancy helps in reducing the symptoms of nausea and in proper brain development in children. 6. Walnuts work wonders for the hair; they're rich in biotin, prevent hair fall, improve hair texture and strengthen them. Add them to muffins, breads, brownies, chocolates etc. What things healthy can you cook with walnuts? 1. Pre-heat oven to 350 degree Fahrenheit. 2. Clean and wash mushrooms. Partially boil them for 10 to 15 minutes. 3. Once they are cooled, cut and remove the stems. 4. Add one teaspoon of oil in a pan, saute finely chopped garlic and onions for five minutes, add finely chopped capsicum and pureed tomatoes. 5. Add washed and crushed walnuts to the above mixture. 6. Spice up the mixture with salt and crushed red pepper. 7. Cook for 10 minutes on a medium flame, garnish with freshly chopped coriander leaves. 8. Sprinkle little salt over the mushroom caps and fill them with sautéed walnut mixture. 9. Finally grease the baking dish with one teaspoon of olive oil. Arrange stuffed mushrooms in the dish. 10. Bake for 20 minutes and serve it hot. 1. In a small pan heat oil over medium heat; add cumin and garlic. Stir for 1 minute until toasted and fragrant. 2. Set cumin oil aside to cool completely. 3. Stir together cucumber, 1/4 cup walnuts, lemon juice, yogurt, salt, and pepper. 4. Stir in cumin oil and top with additional 2 tablespoons walnuts. 1. Cut the apple into small pieces and mix the sugar. 2. Add celery and walnuts. 3. Soak grated cabbage in cold water for an hour and strain the water. 4. Place the grated cabbage in a serving bowl. 5. Decorate with apple slices and whole walnuts. The Nutty Affair: Which Nuts Should You Have Daily and How Many?